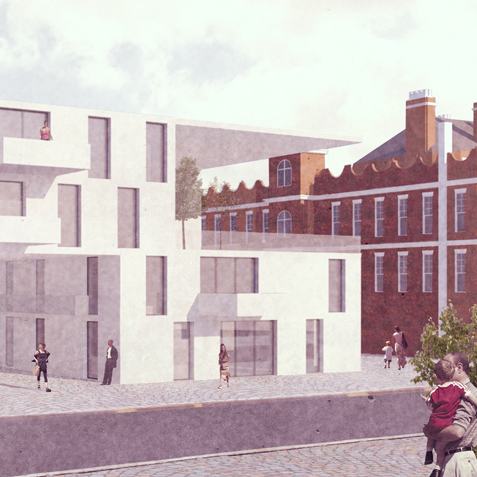 This proposal, Perforated Housing Playstow, reconfigures terrace housing into courtyard living so as to allow for various scales of social connectivity in Plaistow, London Borough of Newham. Perforated Housing Playstow recognises the uniqueness of the site as a large island lost in a sea of terrace housing. 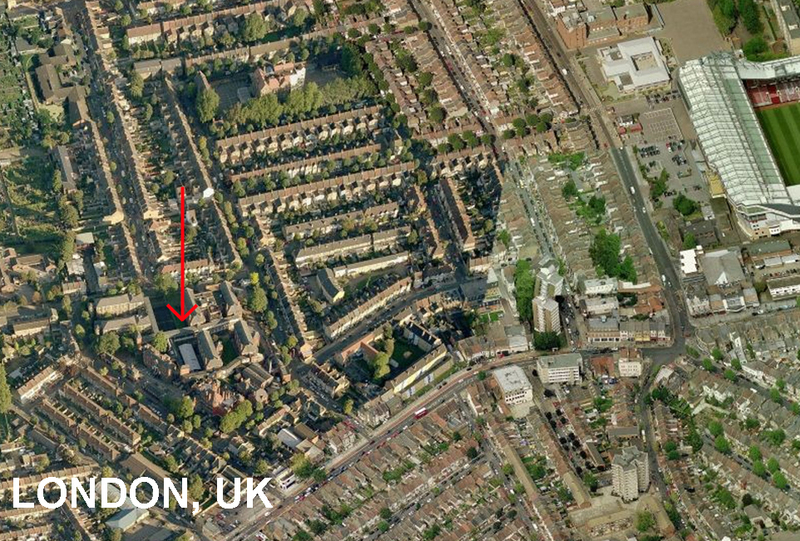 At 120m wide, the site is approximately 3x wider than the adjoining strips of terrace housing. This unusual characteristic has been preserved because it can provide a form of social living that transcends the abrupt interface of private house-garden / public road that characterises terrace housing. 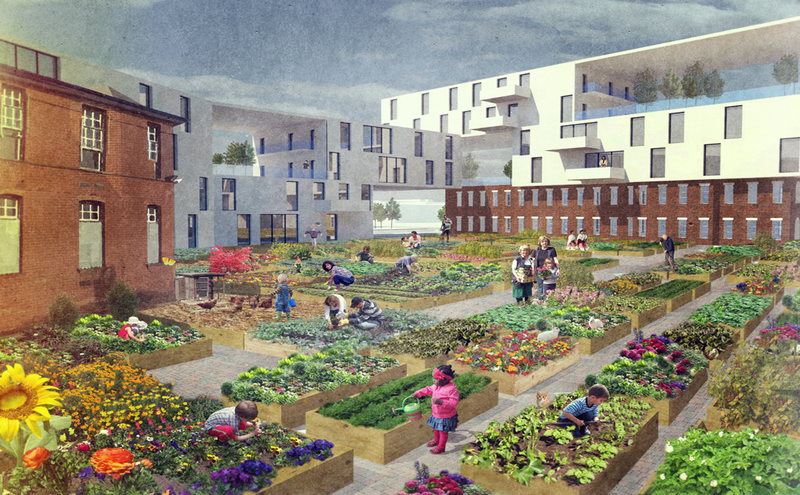 In this sense the project looks to a form of urban living that has a larger urban grain. 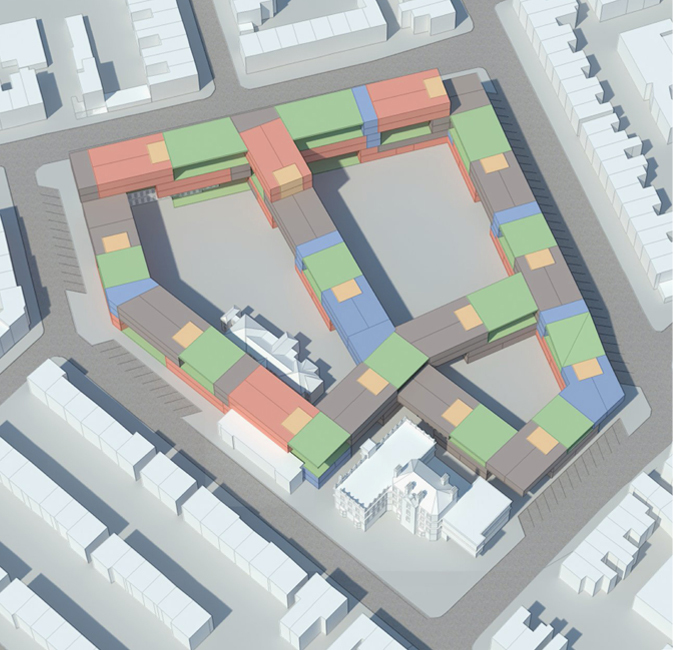 The project represents a form of respected foreigness transplanted: the courtyard typologies of the 80m Berlin block rescaled as a 120m London block. As an urban stratgey it's 'Berlondon' courtyard living let's say. 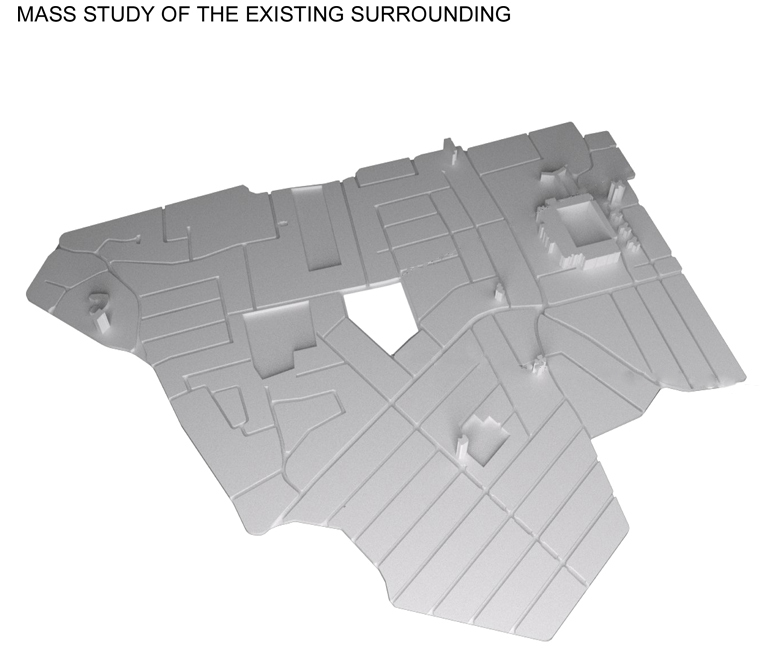 The site has thus not been truncated by roads and a plugged-in parking on the periphery frames on a slower-paced pedestrianised urbanism 'potentialised' across the three central courtyards . Parking here is different: not parallel but diagonal as this avows 90 places, 20% more than the 1:2 requirement, giving 15 parking places to the adjoining residents. The pavement has been widened at junctions to give more space for pedestrian crossings and also around conserved buildings so that internal events can spillover onto the streets to increase engagement. A café in the former Nurses' Home, for example, could help animate the newly created public space at the corner of Sansom Street and Nile Road. The proposed edge treatment is seen as a vital mediator between the existing urban fabric and the proposal. 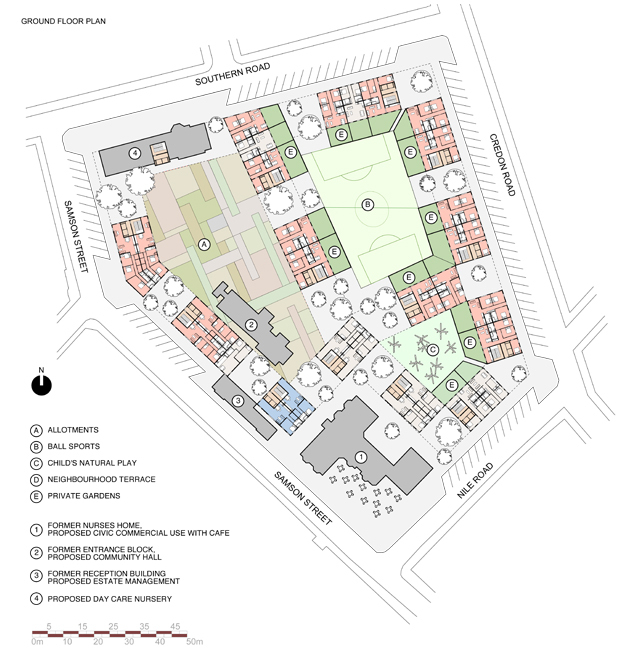 Green space provides the social connectivity for the 150 dwellings. Three scales of garden have been provided to promote social interactivity and a sense of ownership for residents. 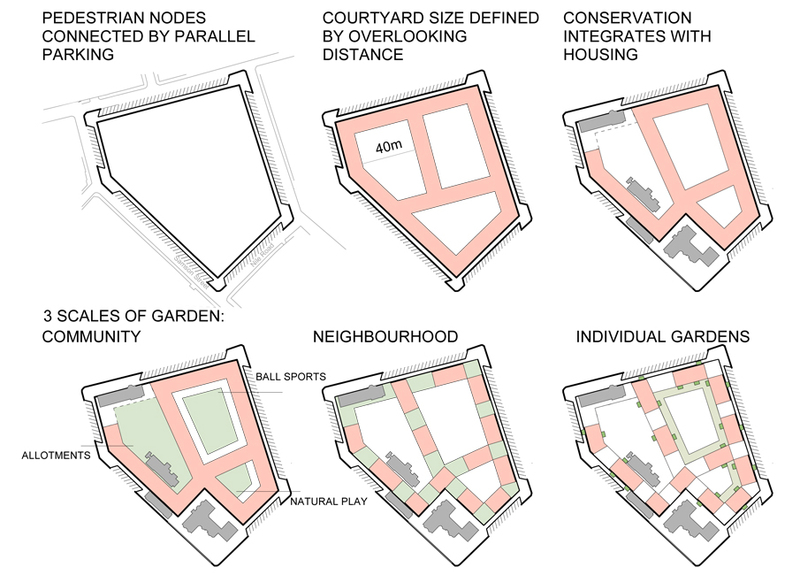 At the largest scale are community courtyard gardens, sized so as to offset overlooking concerns between houses / flats. 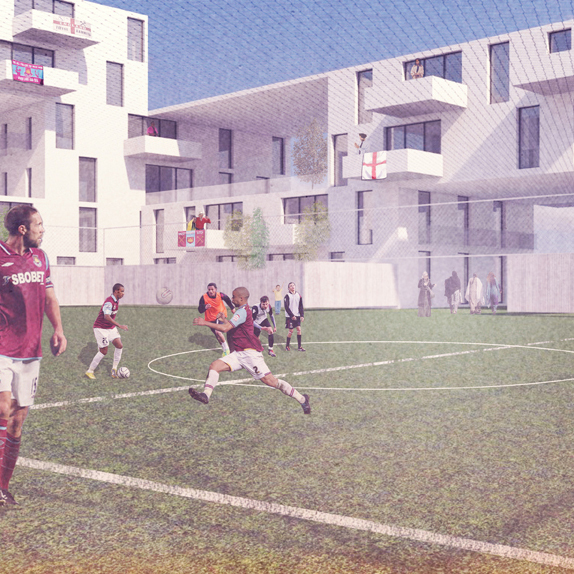 The three courtyards perforate the site and could each, after consultation, be programmed with a different use: allotments, ball sports and natural play could cater for different demographics. 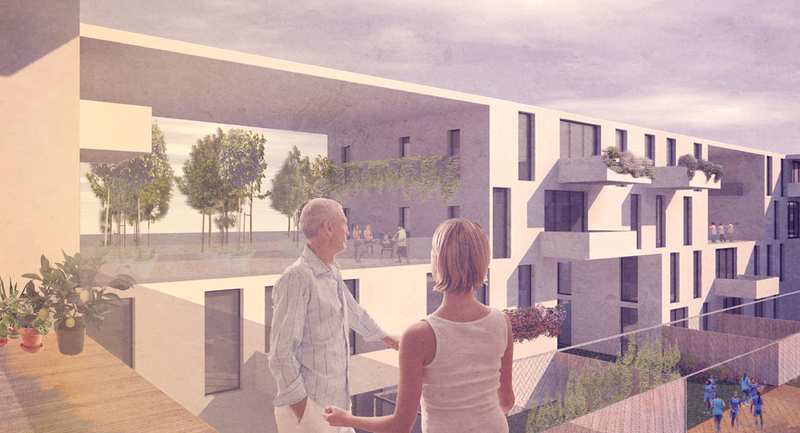 Natural surveillance from the surrounding housing ensures a sense of well-being. Double height neighbourhood gardens (of approx. 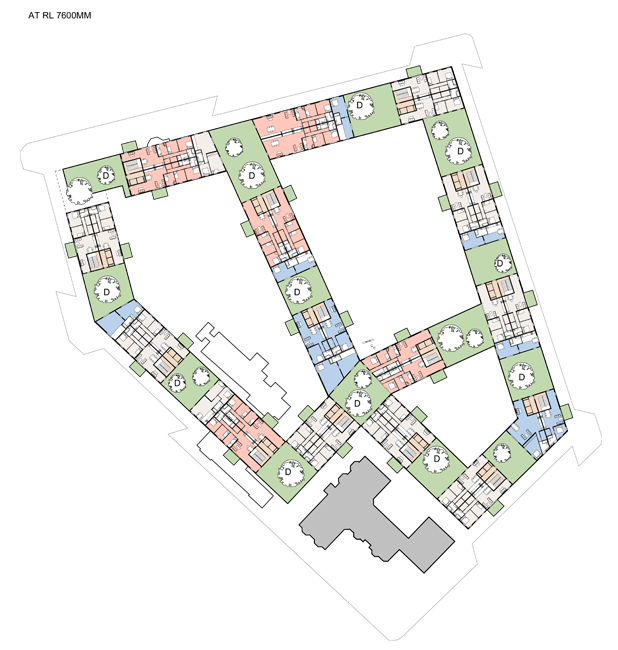 120sqm) vertically perforate the blocks of flats and create social opportunities for six flats to retreat from the wider community yet remain within a collective social space. You could host a kid's party, play table tennis, camp, share cigarettes, set up a group yoga club. Basically get to know your neighbours. 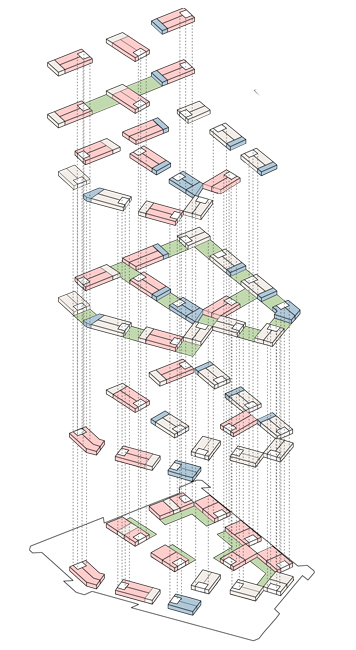 Finally each flat has a cantilevering balcony (minimum 10sqm) which functions as an individual garden where one can eat outdoors amongst the privacy of their family, friends or self. The dwellings are generously sized being 20% bigger than the Mayor's guidelines and having 3m floor-to-ceiling heights. There is no demarcation between a house and a flat in terms of their spatial qualities: what defines a house from a flat is merely its location. Houses are ground-based dwellings where you can park outside your front door and have a garden out the back. Even though Perforated Housing is organised at an urban density, it celebrates the suburban house.